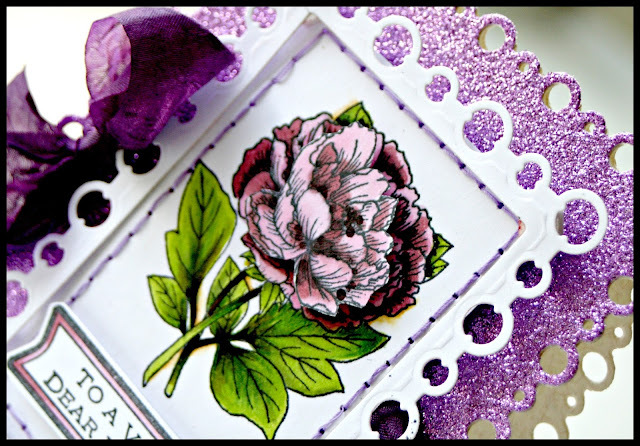 Welcome to the final day of Spellbinders Shape It Up Sneak Peek and Giveaway. 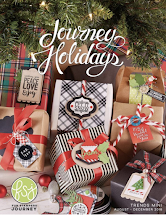 I know you all, just like me, have been amazed by the extrodinary gorgeous Spellbinders products being revealed and of course enjoyed the variety of inspiration offered by so many talented designers. Remember to enter to stand a chance to win!!! 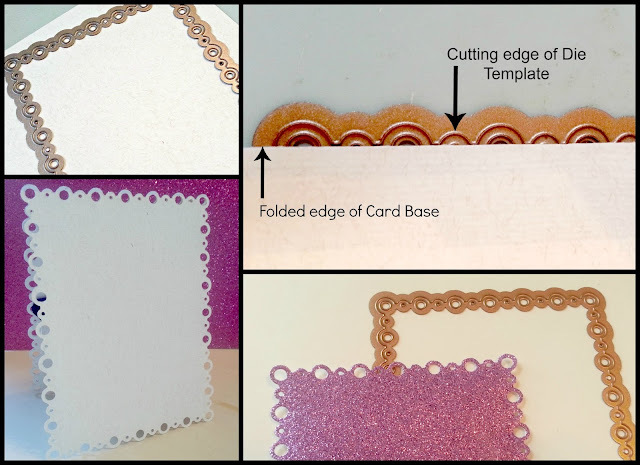 The following tutorial demonstrates how to make a basic shaped card using Spellbinders Die Templates. These steps can be applied to any die template that has a regular or irregular shape. 2. Create a card base from cardstock. Position the folded edge of the card base so that the cutting edge of the die template slightly overlaps the fold (Tip: I like to tape down the sides of the card to the die to hold it in place). 3. Cut the card using the Grand Calibur Machine. Important to note here that we are cutting through two pieces of cardstock (both sides of the card base). Depending on the details of the die it may be necessary to run the sandwich through twice. 4. I sometimes like to create a panel, cut from specialty paper like glitter card stock, for the front of my card. Simply cut a single layer using the same die template and adhere it to the front of the card base. 3. I stamped my flower image onto white cardstock and colored it in with my Copic markes. The sentiment is slightly raised with a foam adhesive and I hand stitched around my stamped image for interest. I love the versatility of Spellbinders die templates. I used the Cindy’s Card Creator S5-194 Pearl Effects as embellishments for this mini framed scrapbook page. This project was repurposing at it's best ...I purchased a white frame from a thrift shop, removed the dated image and created a mini page with an image of my daughter, Alex. We'll be choosing two winners to receive the brand new products released today! At the end of the week we'll choose a Grand Prize Winner who will receive all the new products shown during the sneak peek and a brand new die cutting machine! How awesome is that!? For additional information and contest rules please visit Here. Thank you so much for spending part of your day with me today. 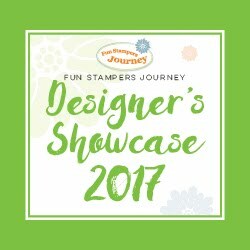 I hope you are just as inspired to try new projects with our new die templates as well as incorporating them with our much loved older sets. Leave me a comment here and let me know what you think. I always love hearing from you. Your projects are very lovely, I'm always amazed at what can be created with dies. Fabulous projects and I can't wait to add these to my collection of A2 dies -- a wonderful addition!!! Wow! These are both beauties! That first one is stunning! Thanks, Kazan! Oh wow, that looks great. It so stands out, very lovely! 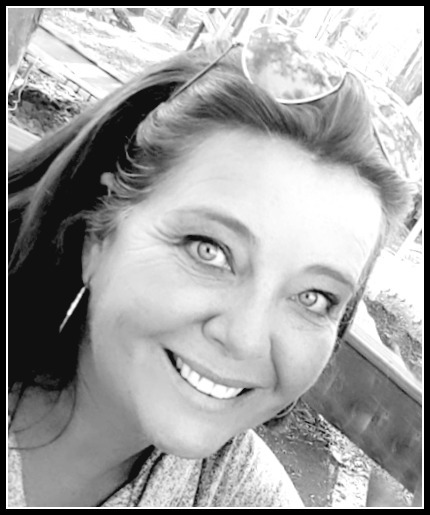 just love what you have done with the new dies and love your blog too. Love both your projects!! Would love to win this & the doily die!! Great projects! Love all the new spellbinders,so many creative possibilities. Absolutely stunning! Loving these new dies. Unique ideas, thanks for sharing. Lovely card, Kazan, and I really like what you have created with with the old frame---just beautiful! Your projects are wonderful Kazan...especially the 3-D frame (lovely daughter too)! Forgot about using my dies to make the card base...beautiful example! Both the card and the framed picture were awesome Kazan. 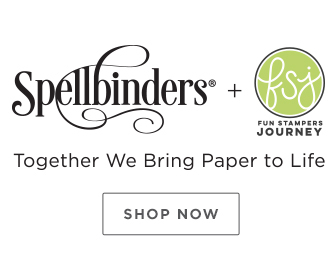 Spellbinders has really given us another fabulous release and I know there are still more to come. They never dissappoint when it comes to creativity and quality. Can't wait to get the new sets in my hot little hands. Thanks for the inspiration. Your projects are just amazing! The framed piece is quite charming! TFS! Beautiful projects with the new (and old) dies. Thanks for sharing how you created them! Love both of your projects the purple on the cards looks fabulous. Love the new dies! Can't wait to see all of them!! Thanks for sharing your beautiful work with us! I appreciate you taking the time to give such easy to follow steps for this project. Beautiful card, and great frame. What awesome projects! They saved the best for last. Thanks for the inspiration! Wow, your projects are absolutely gorgeous!! I love how you used the dies!! Thanks for the amazing inspiration!! Both projects are awesome, but that framae is really amazing and sooo gorgeous. Love what you did here hun. Such a gorgeous shaped card...love it! The frame is just lovely! Wonderful projects -- they show off the new product beautifully! Your card is stunning...absolutely beautiful. I think the framed layout would be wonderful on a coffee table or as a gift. I like the idea of every now and then framing a layout I especailly like to showcase. Many Hugs to you for creating with the dies I designed such Beautiful projects! You are very talented & an oh so sweet friend! Super gorgeous projects! The frame is my fave.....she's a beauty!! I love those dies! Neat edges! Fabulous project showcasing them. Beautiful projects! Your re-do of a thrift store frame is wonderful! Love your projects and that die set is fabulous!! I can think of lots of ways I'd use that one! What a beautiful Die set! Your projects are just gorgeous. Making shaped cards is my favorite thing to do and this Die set is at the top of my wishlist!! Stunning inspiration Kazan! The recycled frame with your daughter's image in it, looks amazing. Thank you. Both the card and the framed photo are stunners!!!!! Such fabulous projects! Thank you for sharing them! 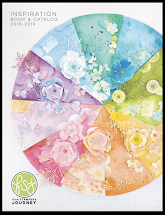 pretty border, love the shimmer paper to go with your lovely flower! Sweet framed piece of your daughter too! Love the picture frame effect in the first card. Wonderful job! Totally gorgeous and such great, versatile dies. I love the card creator series. The dies really do work their socks off! Thanks for sharing your talents. Beautiful card ... lovely layout ( beautiful daughter ) .. Thank you Kazan for sharing. what a lovely layout and love the dies you have used. Hi, Kazan - what a great use of the new Pearl Effects dies - thanks for featuring them in two ways so show how versatile and lovely they are. Beautiful wall decor and wonderfully glittery card! Very pretty card with the Pearl Effects dies, great design. Love the bright glittery card and the new dies Spellbinders has added to our selection of dies we can use with our existing dies. I also love your framed project. A wonderful reminder that we can use our dies for home decor projects. Gorgeous glitterly card and lovely dies. Your framed arrangement of your daughter is lovely! TFS. Botanical cards always feel so wonderful. Beautiful color selection. Lovely personalizing and repurposing for framed portrait of your daughter. Beautiful creations, thanks for sharing them with us for the sneak peeks of the new releases. 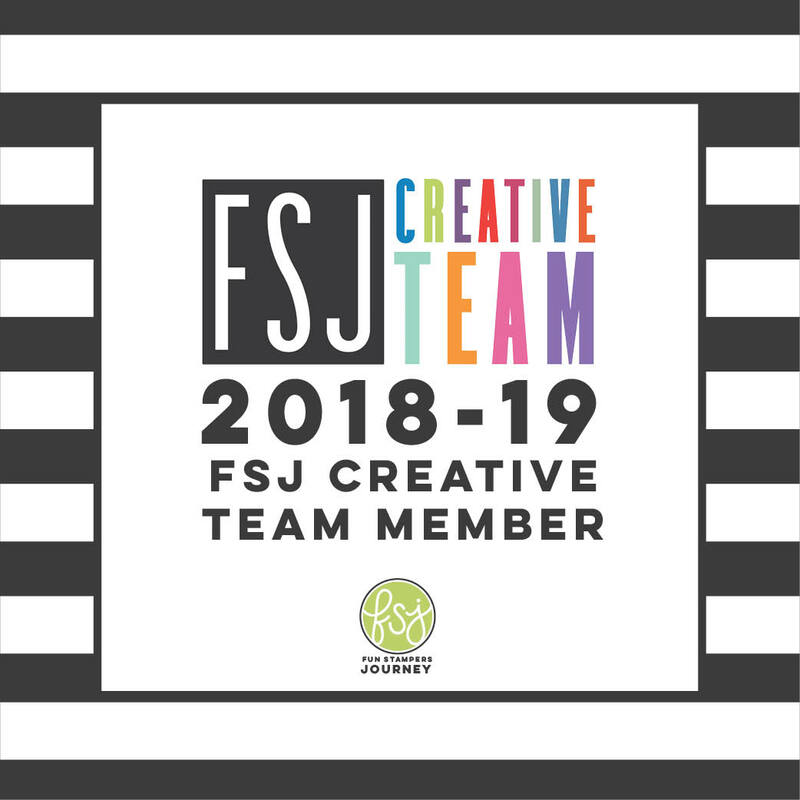 Your projects are both fantastic. 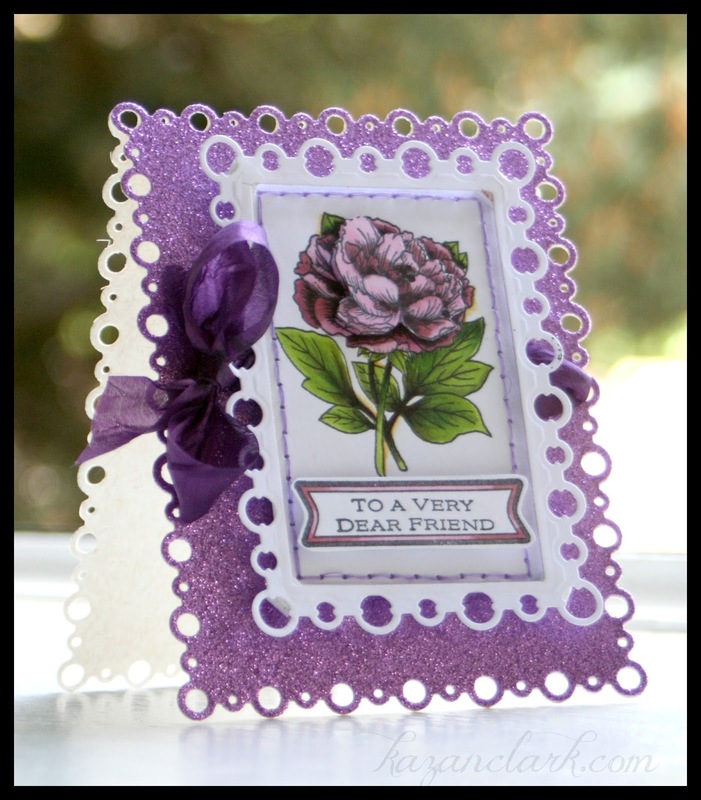 Love the pretty card with the glittery purple, and thanks for the tutorial in making the shaped card. Your re purposed frame with your daughter is something to be treasured. Love both projects, but the card is my favourite, love the colours. Thanks for the great tutorial and for sharing. Your card and framed artwork are lovely! I'm loving the color choice too. Thanks for sharing. Both cards are great, but I LOVE that flower one! Wow-both of your projects are lovely.If I ever got a card that gorgeous I would frame it and hang on the wall.thank you so much for sharing them with us. Absolutely love your sparkly card! 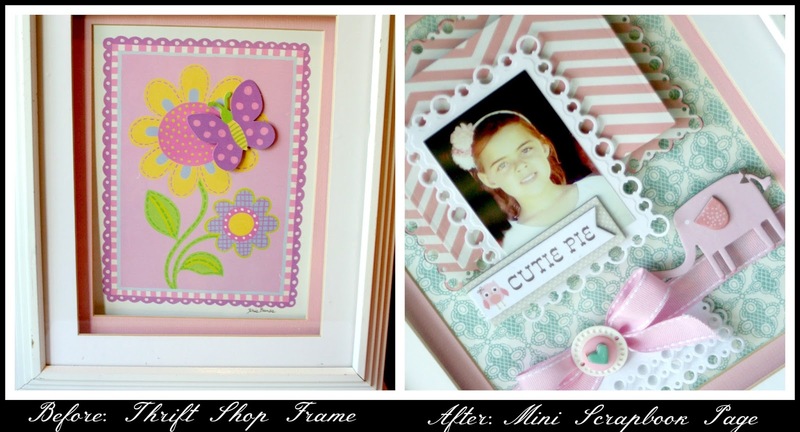 And your mini scrapbook framed page is awesome! Your card and framed scrapbook page both are very nice. The raised window on the card looks really great. Love both projects Kazan - the card is beautiful and the framed scrapbook page is such a treasure. Thanks for the inspiration and tutorial. Beautiful! Love the scrapbook page. Thanks for sharing with us. Absolutely STUNNING work posted here. Thank you so much for allowing a look. Absolutely beautiful Kazan! The card is stunning and the frame is sweet as can be! LOVE! 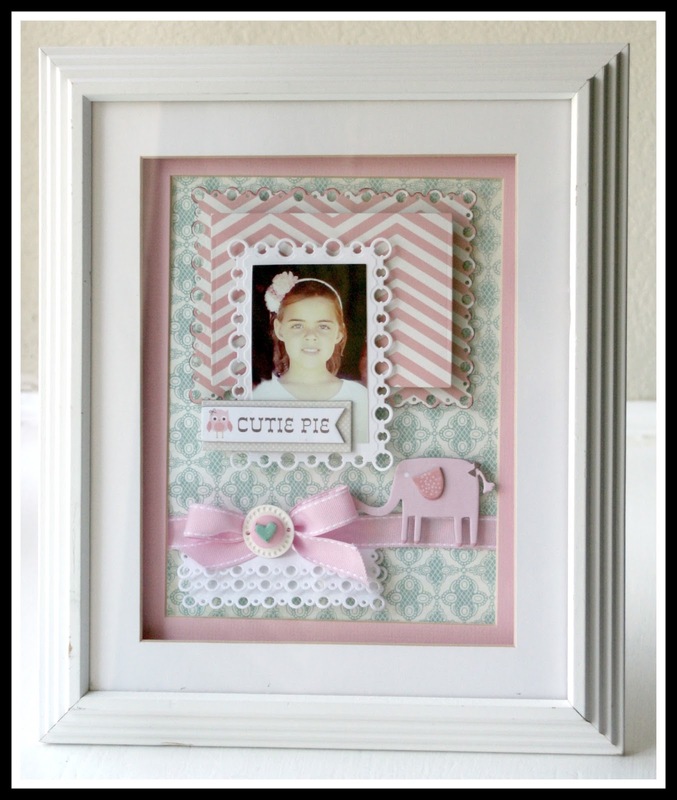 Your card is gorgeous and the frame is adorable! Wow!! Two awesome projects! Such a beautiful new die set, too. Awesome versatile dies!! Beautiful projects!! Love the card! Thanks for the giveaway! Beautiful projects. Your card is stunning. I love the colors. Thank you for the wonderful tutorial!!! Your projects are so gorgeous!! Oh my goodness, your projects are gorgeous. Love the die as well, it's pretty enough for a feminine card/scrapbook LO or for a masculine project. Love it! I love how you used the glitter paper for the ornate die cute mat. so cute!